Dry fix roofing systems are becoming increasingly recognised as a simple and effective method of fixing tiles and slates. They include benefits such as being cost-effective and easy to install. They also remove many of the issues with reliability and weather dependency that comes with traditional mortar. However, the increased usage has resulted in the need to revise both quality and design. This has brought forward the new British Standard BS 8612. BS 8612: Dry-fixed Ridge, Hip and Verge Systems for Slating and Tiling is a new British Standard that was introduced in early 2018. It aims to provide clear guidance on the quality and performance of dry fix roofing systems. With recent changes in industry guidelines and standards, as well as growth in the dry fix market, a wider range of dry fix systems became available. However, an increasing number of cases were reported regarding dry verge failures. Poor design, materials and incorrect installation are some of the main contributing factors to these failures. What does BS 8612 cover? Installation: even using an incorrect type of nail will affect the performance, so using the correct tools and materials is key. Choose from a wide choice of dry verges to complete your pitched roofing project. The type you choose will depend on the application. 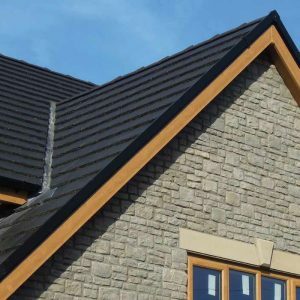 For example, PVC continuous dry verge is suitable for use with concrete, clay, interlocking and plain tiles, whereas GRP continuous dry verge is designed for use with all natural and man-made slate tiles. Individual units and aluminium continuous dry verges are also available. If you would like more information, or are unsure of your requirements, contact our customer service team on 01752 692 760 for advice and recommendations. Alternatively, use the live chat function in the bottom right-hand corner of our website.